Express Laundry Center Marketing Support Glean the Advantage! 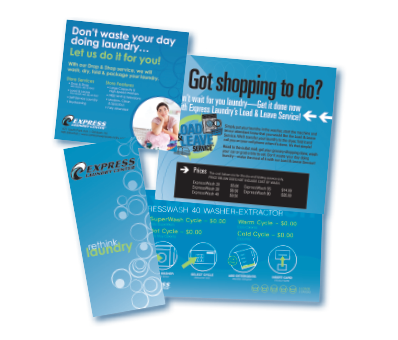 An Express Laundry Center investment includes access to marketing/advertising support to promote your laundry to existing and potential customers. The offering of services includes a vast array of tested and proven materials and campaigns. And, for an additional fee, our creative staff will customize each piece with your laundry’s contact information, obtain mailing lists, arrange printing and mailing (if required) and/or submit advertising artwork to local publications. We will handle all of your advertising needs – from start to finish!